Submitted Photo Back — left to right: Carl Hamann, Carl Waclawski, Tom Safford, Bob Price, Paul Nichter, Jim Christy, Carl Lis. Front — left to right: Michele Bernatz, Rich Cowan, Donna Bjurlin, Carl Bjurlin, Dennis Wolfe. Not present: Dan Cassidy, Alan Freville, Larry Van Deusen. 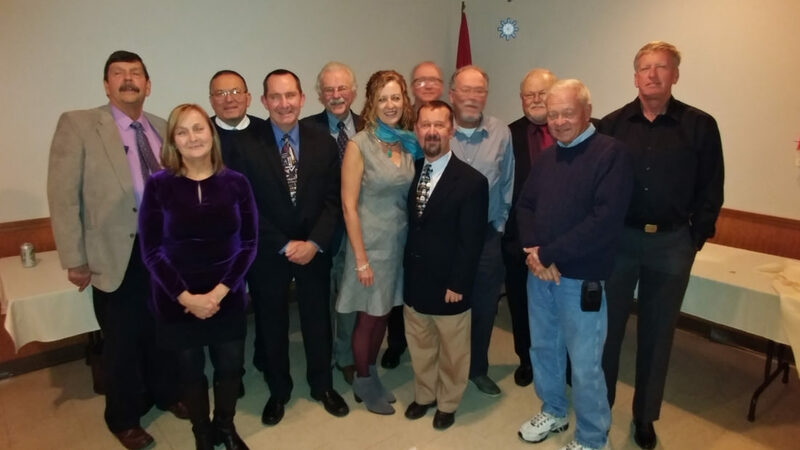 The Dunkirk Yacht Club installed the officers and directors for 2019 at their Fall Banquet at the Beaver Club in Fredonia, Saturday, Nov. 3. The invocation was delivered by Life Member Chet Bates. Outgoing Commodore Donna Bjurlin thanked the Board and everyone for a successful 2018 season. She also thanked her husband, Carl for all his help and support. She then passed the gavel to her successor Bob Price. Incoming Commodore Price, in turn, presented her with the flag of Past Commodore. He continued, introducing the 2019 Officers, presenting each with their flag: Vice Commodore – Carl Lis; Rear Commodore – Dennis Wolfe; Secretary – Carl Hamann; Treasurer – Carl Waclawski. Also serving on the board as committee chairmen: Rich Cowan – Membership; Alan Freville – Education; Jim Christy – Social; Dan Cassidy – Facilities; Michele Bernatz – House; and Tom Safford – Race & Recreation. Appointed: Dockmaster – Carl Bjurlin, Web Master – Larry Van Deusen, and Newsletter – Paul Nichter. Race and Rec. chair Safford announced racing awards – the Chet Bates Memorial Day Trophy, Commodore’s Race Trophy and the “Van’s Legacy Trophy,” which goes to the overall winner of the season’s three major races – Memorial Day, Independence Day and Labor Day – went to Carl Bjurlin on S’Urchin Too!, with crew Tina Rausa, Marv Bjurlin and Tom Safford. The “Sloppy Sailor” Award had several worthy candidates, so much so that Jim Christy, last year’s winner, deferred to an independent party to make the choice – which resulted in the first time the same person was presented the “major award” two years in a row. Congratulations – Jim Christy! Earlier, Outgoing Commodore Donna Bjurlin thanked those members who served with her: Vice Commodore – Bob Price; Rear Commodore – Carl Lis; Past Commodore – Doug Reid; Secretary – Carl Hamann; Treasurer – Carl Waclawski; Membership – Rich Cowan; Facilities – Alan Freville; Education – Scott Foley; Social – Jim Christy; House – John Tallett; Race & Recreation – Tom Safford; Dockmaster – Carl Bjurlin; Web Master – Larry Van Deusen and Newsletter – Paul Nichter. Arrangements for the evening were made by a committee of Wally and Carol Gotowka and Tom and Mary Wik. Live music was provided by Tom Bender.